Venezuela's president, Nicolas Maduro, told a packed auditorium on Sunday what sounded like good news: The minimum wage is going up 50%. But that won't help ordinary Venezuelans. Inflation there could skyrocket 720% this year, according to the International Monetary Fund. As inflation goes up, the country's currency buys less and less. 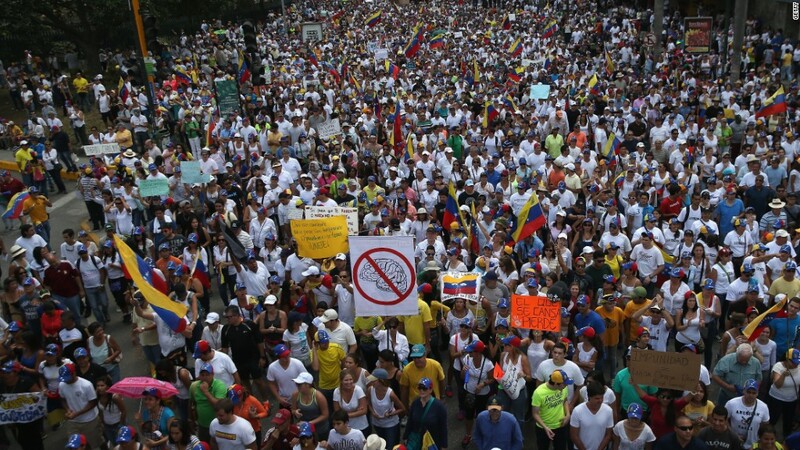 The wage hike actually epitomizes Venezuela's spiral into chaos of all kinds. It's the third time this year Maduro's government has hiked the country's minimum wage to combat extremely high inflation and an increasingly worthless currency. Prices for food, medicine and other essentials rise weekly if not daily. Staggering wage hikes still aren't keeping pace with rising inflation, which is a result of years of government overspending and mismanagement, along with severe shortages of food, medicine and even cash itself. The latest increase brings Venezuela's minimum wage to 97,531 bolivars a month. That's equivalent to $12.53, according to the unofficial but often used exchange rate of dolartoday.com. Official government exchange rates are considered overvalued. Including Venezuela's equivalent of food stamps, the total pay package now rises to 250,531 bolivars, or $32.19 a month. At the time of Venezuela's last wage hike in late April, the total package equaled $46.70. That's a sign that prices at the grocery store and pharmacy are rising much faster than wages. Maduro's announcement comes after a bizarre week, even by current Venezuela standards. On Tuesday, police officer Oscar Perez stole a government helicopter with a team of accomplices, flew over the Supreme Court, dropped grenades, fired shots and then flew around the country's capital, Caracas, for about two hours. The whole scene struck Venezuelans as odd: no one at the Supreme Court was injured, military forces did nothing to combat Perez flying in plain sight and Perez had a part-time acting career. Government critics said it was a stunt by Maduro to justify using a heavier hand on protesters. Maduro condemned the attack and denied any involvement. Maduro also battled last week with his attorney general, Luisa Ortega, who broke government ranks this spring and has lambasted Maduro for alleged humans rights abuses. The Maduro-backed Supreme Court froze Ortega's assets and ordered her not to leave the country as she may face a trial. Opposition lawmakers were also physically pushed around last week at the country's National Assembly by the national guard, which is controlled by Maduro. Some Venezuelans clearly didn't care about the week's events on Sunday. Many cheered Maduro's call for a new minimum wage, which was broadcast on government television. However, others in the auditorium sat stoically silent.